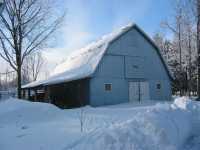 Big Blue Barn: Long weekend already over? Another long weekend went by in the blink of an eye... But boy have we been busy! Friday we picked up the new (to us) car at the US border. All that's left now is a mountain of paperwork and checks, and we should be able to register the car in Ontario, and then we can breathe a sigh of relief. Importing a car from the US is not for the faint of heart, although truth be told, so far it couldn't have gone more smoothly. Saturday we had a Thanksgiving dinner at our friends'. It's a tradition thing, they've been hosting Thanksgiving dinner for the group for years. As always, I was tasked with bringing a vegan entree, and this time I went mediterranean, with a 7-veggie couscous. In the end, I think it was more like 10 veggies, but who's counting? It turned out pretty yummy if I may say so. Not that hard to make either, it just requires a whole bunch of different spices (most of which were luckily already in my spice rack). Dinner was great, as always, it's nice to get together with the gang. Our friends' 6 year old is getting really excited at the prospect of having a new little friend to play with in the next few months, and she's so sweet to me (well, mostly my belly). Sunday, DH's sister and her husband were in town, so we went out for breakfast. After that, they came over to our place, where we hung out for a while. Then my parents arrived, and we hung out some more. It was nice to have some family time, especially since DH's family and mine rarely get the opportunity to meet! We got to admire BIL's brand new tattoo. The consensus amongst the ladies was that the tattoo was a bit over the top, while guys thought it was cool :) Apparently, what originally started as a design of a simple maple leaf had over the years grown to include a very colourful (and faithful) reproduction of BIL's beloved motorcycle with a maple leaf in the background. He does seem pretty happy with it, though, so the pain (and nagging from the wife and other female relatives) must have been worth it. I really hope DH never decides to get a tattoo, as I have no good reasons to ask him not to other than "I'm not crazy about them". After DH's relatives left, we worked outside for a bit, and then had another huge turkey dinner. It felt a little sparse with just the four of us, both of my sisters being very busy in Montreal. But the food was good, and the evening went by in a flash. We concluded the festivities with a viewing of the night's episode of "Laflaque" and "Tout le monde en parle", two shows my Mom likes to watch on Sunday evenings. Monday was very busy again! The weather turned out pretty nice, despite all the predictions of rain, so my parents decided to stick around and do some more outside chores. We now have a huge pile of wood to burn this winter (yay!). DH was very busy trying to get over a cold he's had on and off for the last two weeks. Unfortunately, he's still not completely healthy, but at least he got a chance to rest a bit and even catch a few Zzzz's. We concluded the weekend by watching a few more episodes of "Wild Palms", a miniseries from the early 90's that DH picked up recently. The action takes place in 2007, and it's interesting to see how many political parallels one might find to the current situation in the US. Of course the miniseries is sci-fi, so a lot of stuff is a little over the top, but quite a few things were predicted (guessed?) right.